iFly 15 Flying singlehanded – it’s easy! 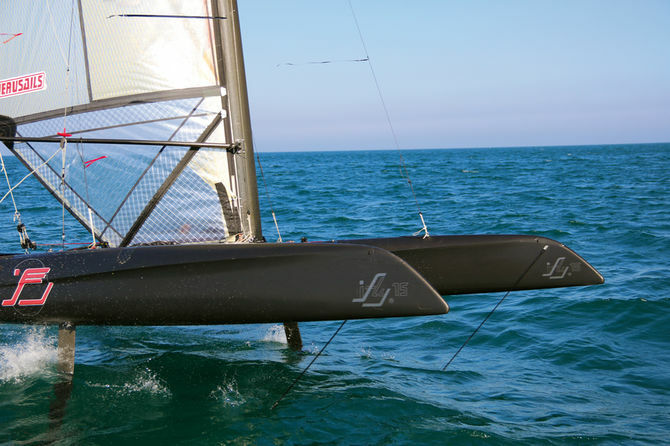 The iFly 15 is capable of sailing on its foils from 10 knots of wind, and is surprisingly stable. Michael Miller has perfected a thick sail which is high-performance, reliable and easy to use. Thanks to its beam limited to 2.55m (max for road transport), the iFly 15 can be transported by road, flat and with no dismantling. An attractive catamaran with sharp lines. It makes you want to sail…flat out! Top speeds of nearly 30 knots on a machine less than 5 meters long, transportable behind a car with no dismantling whatsoever…the stuff dreams are made of, no? Getting to know a terrific little toy, which…flies! Create a notification for "Sports cats"
Flying multihulls are not new; Eric Tabarly succeeded with no trouble in 1976, with his Tornado hull attired with two floats. Then there was Paul Ricard, the Hydroptère…and soon kite boards, then stand-up paddle boards with foils. And of course multihulls and now practically everything which races on the water. So, is that it? Foils are within everyone’s reach? Can we have a go too? 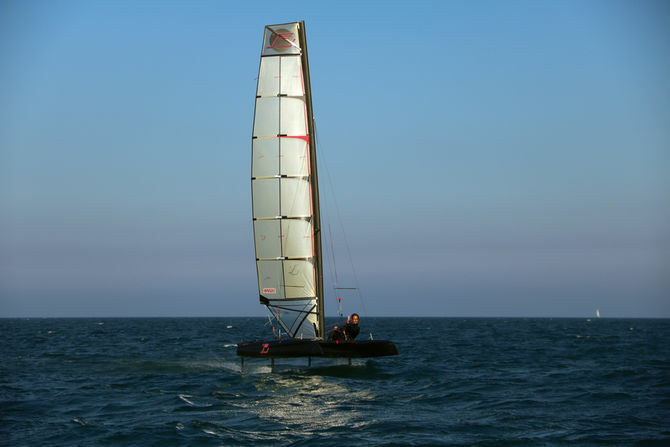 On the market, in any case, there is a lot of movement in the little world of flying catamarans. And among them, one machine in particular caught our attention. This is the iFly 15. Unveiled at the fall boat shows, the machine’s small size is surprising: under 5 meters for the hulls, 2.55m wide and weighing in at just 90 kg – for the production model, as our prototype proved to be appreciably heavier. At the start of the project, Gilbert Saint-Blancat (a former aeronautical engineer, prominent in the field of foils…) had to be content with designing the carbon T-shaped appendages. Finally, it was also he who designed the wave-piercing hulls. He retained quite slim sections over the whole length, to reach a good compromise between high speed and reduced pitching. The aim therefore is to fly singlehanded or as a duo, easily. Understand that you will not have to adjust the foils. You fly, steer, trim your sail, and that’s all… Apart from a basic adjustment of the four appendages (two daggerboards and two rudders) which you will learn to master as you sail more and more, the control under sail is carried out automatically, thanks to the flaps in the daggerboard foils. Linked to sensors fixed to the bows, these flaps are able to anticipate the boat’s trim, and even anticipate the waves. The principle is quite simple: if the hull is not flying, the very horizontal sensor controls – via stainless steel and carbon rods – the descent flaps, to provide maximum lift. If the hull is too high, the vertical sensor makes the flap go back up – the lift is weaker. Of course the system would be even more effective if the whole foil was mobile. In this case, we would even be able to obtain negative lift to windward and in theory imagine never having to sit out… Before observing carefully this machine’s behavior in the hands of Michael Miller, its designer, let’s have a glance at the rig and the deck plan. The carbon mast supports a very clever thick mainsail. The whole of the luff is doubled and held by different battens on either side. The bolt rope is equipped with a gusset to create some volume. Once hooked, the sail displays a perfect profile, once the luff tensioning line has been pulled taut. On the double thickness trampoline – the aim is to generate a lift effect – very few adjustments and lines are visible: they are cleverly hidden between the two skins.